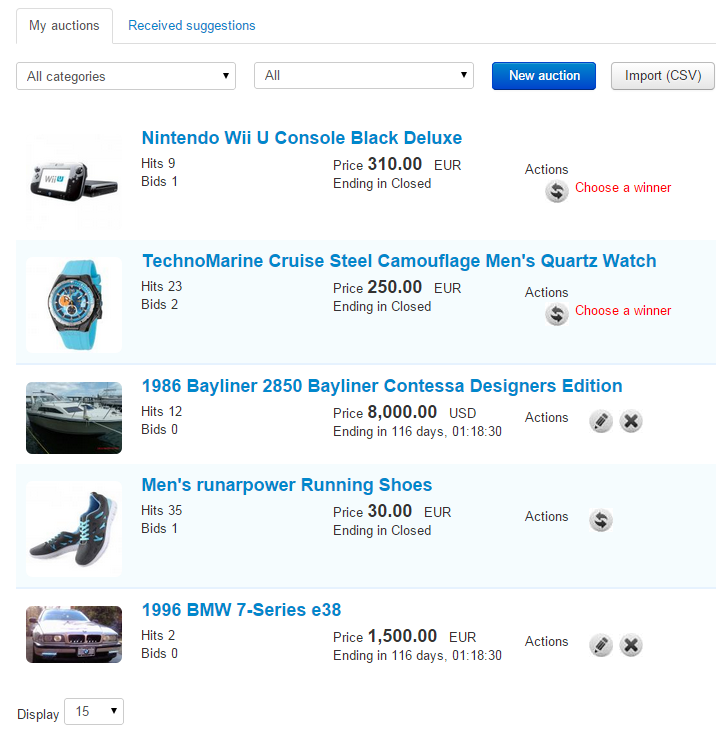 Auctions can be viewed, modified, sorted and created from both the backend and frontend. There are lists in menus allowing these actions available for easy use. Some limitations and different workflows may apply. Multiple sorting and filtering features are found here, an Auction Manager is implemented that allows you to filter auctions when browsing. You can enter a keyword, username and/or a specific category along with the option to sort them by columns. On the right side of the page, you will also find more auction related details, such as auctioneer details, bid list and messages, all in a tabbed compact format. Clicking on List Auctions from the user menu will display a list of all the active auctions, while also having 2 additional tabs which only displays the auctions with or without a BIN price. A search bar is available at the top of the page, that allows users to filter the results by adding keywords and/or selecting a certain category. Display as a Grid - Shows the auctions arranged horizontally in a grid formation. Detailed Listing - Shows additional information such as the rating of the user, number of tags, number of bids and more. Simple Listing - Shows basic details of the auctions, can be seen in the picture below. My Auctions page will show a list of all the auctions made by the logged in user, allowing him to edit or cancel them, if needed. From this page users can also add new auctions by pressing on the New button, and, if enabled by the administrator, they can import bulk auctions using a CSV file. 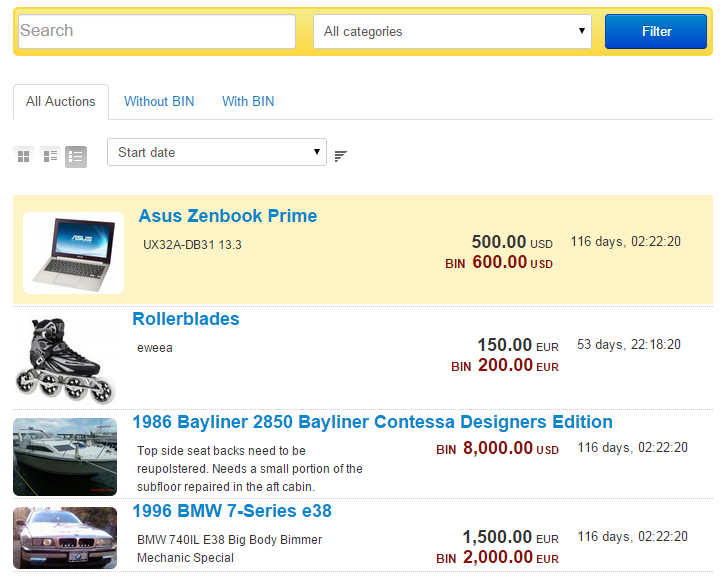 An additional tab, called Received Suggestions is available, which will display the price suggestions received from other users on the logged in sellers' BIN-only auctions. My Bids page contains a list of all the bids submitted by the logged in user with information related to those auctions. Two additional tabs are available here, one representing the price suggestions made by the user on the BIN-only auctions and another one, containing a list of the already won bids.